Designed to personalize your playing experience, each Solo guitar has a Side Monitor Soundhole that virtually puts your ears in the audience while you play, without diminishing the forward sound projection of your music. The Solo removes the frustration of not being able to hear your playing. We have chosen warm, solid red cedar sound for the tops. We have upgraded to African ovangkol and ebony, replacing Indian rosewood used previously. Ovangkol grows in tropical west Africa and has a similar specific gravity (density) to Indian rosewood. African ebony is a far superior fretboard and bridge material. The Solo Series includes a full assortment of instruments. The Breedlove Bridge Truss in combination with the red cedar tops enables each of these instruments to produce warm, blossoming complex notes, facilitating songwriting and performing. Each instrument is factory equipped with LR Baggs EAS VTC electronics and a deluxe thick padded gigbag. You will sound better, play better and play more on a Breedlove. 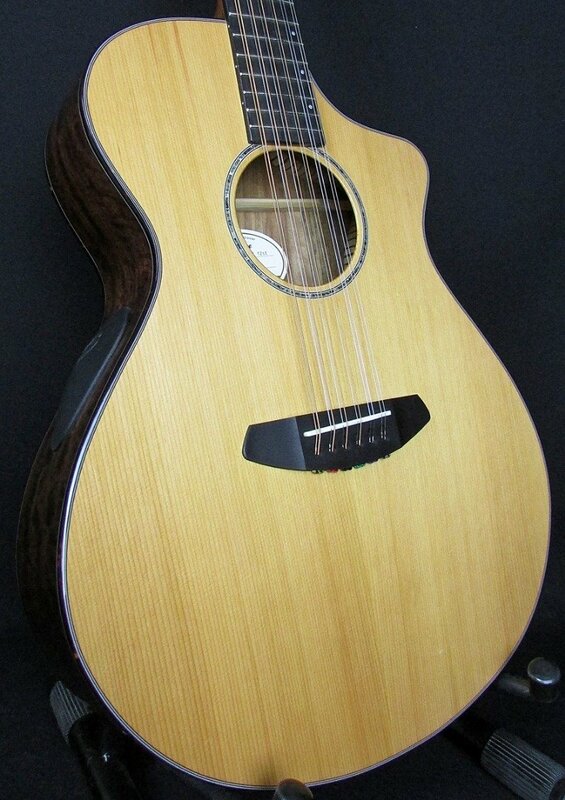 Breedlove specializes in 12-string guitar design. The asymmetrical headstock allows all 12 strings to approach the nut straight on. The comfortable 1 7/8th inch neck facilitates bar chords. The Delta pinless bridge makes it far easier to change strings. The Breedlove Bridge Truss compensates for heightened string tension making it unnecessary to use D tuning. The red cedar and ovangkol fill the room with a curtain of sound.